For any business dealing with cross-border transactions, is is critical to learn and understand key characteristics of each country’s business culture in order to achieve business success. For example, in Saudi Arabia, workers are relaxed about timekeeping and thus arriving late is accepted. 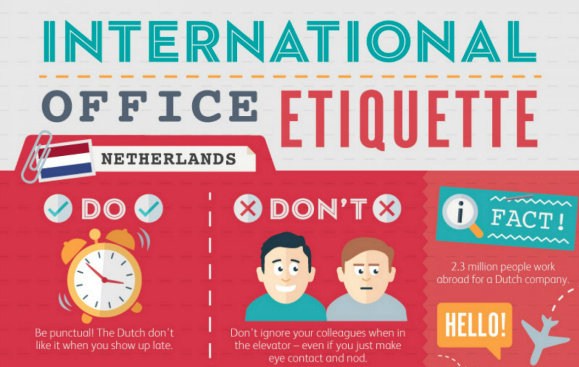 In contrast, take care to be punctual in Germany and the Netherlands, as lateness will be perceived very negatively there. In many countries, socialising is a key component of business networking, so be prepared to actively engage colleagues and clients with small talk and out-of-office socialising. For example, be prepared for frequent business dinners in China. Similarly, Spanish people often socialise until late evening, so plan to join them. Further, socialising over coffee is very important in France and Russia, just like socialising over tea is very important in the U.K. Make sure you take advantage of such socialising opportunities and join others in beverage breaks. Finally, pay special attention to what clothing is considered acceptable. Russians expect others to dress formally, to impress, and Germans expect business dress all year round, regardless of the whether. In contrast, if doing business in a creative environment in the Netherlands, wear casual clothing, as it will be expected. Whilst doing business abroad can be exciting for any businessperson, their experience will be most successful by taking time before the trip to research acceptable and unacceptable behaviors and office etiquette of the host country.